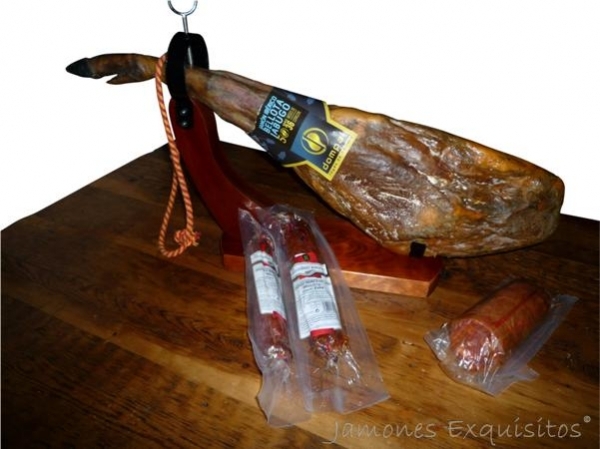 The Iberico Jamon Bellota D.O 5J, is the best cured Spanish ham available. Reared in oak filled meadows, and fed solely on Acorns (over 90% of their diet), and having to consume a minimum of 3kgs a day to achieve optimum weight. Cured in the cellars ("Bodega") of Jabugo in Huelva for at least 36 months. The highest grade achievable is certified with a "5J, or Cinco Jotas" meaning "5 Star." This ham will give the finest, richest and nuttiest taste (derived from the 3kg of acorns fed a day, and cured delicately and lovingly by ham masters for over 3 years!) that you can get from a Spanish ham. Quite simply the best that money can buy, and still cheaper and a better grade (the finest of the fine that the Spanish secretly keep for themselves!) than anyone else in the UK, so if you are a true Jamon lover, this cannot be overlooked. The careful control of this pigs diet provides the healthiest and low cholesterol fat available in any other ham! This picture was the first one i had myself, and i have always had one 'on the go' since!